Chinese armed drones have been operated or ordered by 17 countries. China’s overt offshore military presence has grown in recent years. These activities vary, ranging from operating the first Chinese overseas military facility in Djibouti to conducting patrols in the Indian Ocean. However, China has long used its extensive arms industry as a way to gain footholds – even if just through minor links. Their sales of drones are a clear example of this. Most armed drones today are built by the United States, China, and Israel. The United States mostly sells to NATO allies, increasing the interoperability and common supply chains within the alliance. U.S. sales to India are an attempt at supplanting Russia’s influence – part of the larger U.S. focus on Asia, including countering China. Israeli provision of drones to India are part of a larger defense cooperation between the two, while their exports to Azerbaijan provides a presence just north of the largest regional rival, Iran. Chinese armed drones have been operated or ordered by 17 countries. While visually similar to the U.S. and Israeli drones, China’s are cheaper and less advanced – all the while quite operational. What is curious is to whom the Chinese are selling to, and their relation to wider policies and strategic choices. The buyers are widely dispersed; China has an interest in building links with these countries because of geographic position, economic conditions, or political situation. Most already have Chinese investments, loans, and other weaponry. Many of the countries importing Chinese drones lie along the path of China’s Belt and Road Initiative (BRI). Pakistan and Myanmar have long-standing ties with China, and both are now flying Chinese armed drones, with Pakistan even producing a licensed version of the Wing Loong II model. Further inland, Kazakhstan, Turkmenistan, and Uzbekistan have all received armed drones from China. All five of these countries are critical for the BRI to function, and have seen increasing Chinese investments and connections over recent years – including significant military investments in addition to the drones. Chinese interests extend also into Africa. Egypt, Algeria, and the Ethiopian involvement in Somalia all have roles to play in the continued viability of maritime trade from China to Europe. Zambia has large Chinese investments in their mining regions, while Nigeria has oil and importantly lies on the Gulf of Guinea. These African and the above mentioned Asian states are positioned along vital trade routes, giving China a distinct interest in building relationships and providing tools to help secure trade. The combination of both trade and investments provides ample excuse to provide drones in addition to other weaponry – all with increased ties to the Chinese military and defense industry. In the Middle East China is more opportunistic in selling their armed drones, supplying them to countries that cannot get drones from Israel or the United States for economic or political reasons. While the Israeli constraint is obvious, Iraq and Jordan are both hindered by the high cost of U.S. drones – instead opting for Chinese versions for their fight against the Islamic State. Politically, the Saudi- and Emirati-led campaign in Yemen is more problematic, where they are accused of war crimes utilizing Chinese drones. 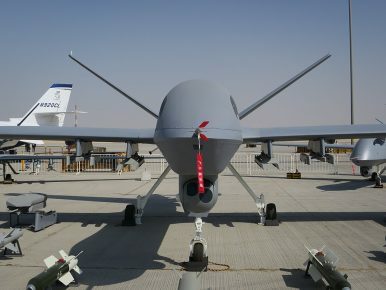 The lessening influence of the United States in the Persian Gulf also provides inroads for China to replace Washington, with their drones being a useful tool in this endeavor. No matter the location, all of the operators get pulled toward China. The sale of drones causes an increasing dependence on Chinese materiel – such as spare parts and missiles – to operate in the first place. The drones also create a necessity to maintain defense ties with China for training and operations. These are, after all, quite advanced and complicated machines. In their armed drones, China has found a way to increase their influence and expand their presence with any country that that the United States and Israel will not – or cannot – sell to. Fully aware that the drones are pulling them toward China, why would other states choose to receive them? Simply put, most of the countries discussed above either need or want the capability that operating drones can bring. This stretches from the more basic, like conducting long-range surveillance patrols, to the more infamous, in the form of armed strike missions. Many of these countries are also engaged in murky conflicts and accused of abuses. China’s willingness to supply armed drones and countries’ demand for them provides a win-win situation: China gets a foothold, while the receiving end gets their weaponry. Especially when the United States and Israel are unable to supply their drones, why would a country in a conflict willingly abstain from improving their capability? Most modern manned aircraft have significant costs involved in procurement, maintenance, and use. Training a pilot can cost millions of dollars — an investment that does not necessarily disappear with unmanned aircraft. It does, however, lower the risk of losing the aviator. For countries with poor maintenance standards and a history of unfortunate mishaps, this is a salient point. Combined with the advanced age of their existing airforces, the cost of operating traditional planes in the first place can be insurmountable. Chinese drones offer a similar, albeit lower, capability to manned aircraft and at a cheaper price. China’s proliferation of armed drones benefits their strategic vision, protecting their investments and interests, and provides a foothold. Meanwhile countries are willing to accept increased links with China in exchange for a new capability and tool for combating threats. This willingness is only magnified by economic and political isolation from other options. The capability gap exists and will not disappear – and China will be there to fill it with their armed drones. Henrik Paulsson is a researcher with the Military Transformations Program at RSIS in Singapore. Beijing is heavily investing into the development of longer-range UAVs.